NBC's David Gregory Won't Be Charged For Showing Ammo Magazine : The Two-Way When NBC News' David Gregory displayed what he said was a high-capacity ammunition magazine on Meet the Press last month, it prompted Washington, D.C., law enforcement officials to investigate whether he had broken a city law. But on Friday, D.C. prosecutors announced that Gregory would not be arrested or charged with a crime. 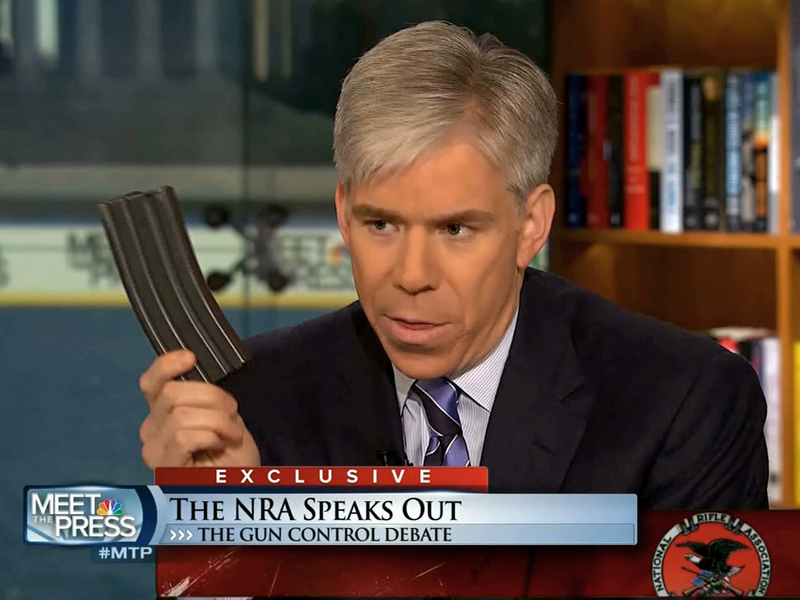 Meet the Press host David Gregory holds what he described as a high-capacity ammunition magazine during the Dec. 23 program. When NBC News' David Gregory displayed what he said was a high-capacity ammunition magazine on Meet the Press last month, it prompted Washington, D.C., law enforcement officials to investigate whether he had broken a city law. As Mark reported Dec. 26, D.C.'s official code says in part: "No person in the District shall possess, sell, or transfer any large capacity ammunition feeding device regardless of whether the device is attached to a firearm." But on Friday, D.C. prosecutors announced that Gregory would not be arrested or charged with a crime. "D.C. attorney general Irvin B. Nathan announced his decision Friday afternoon by releasing a letter to an attorney for NBC. Nathan wrote that though the device Gregory held up 'meets the definition' of the criminal statute, he wrote that prosecution 'would not promote public safety in the District of Columbia nor serve the best interests of the people of the District to whom this office owes its trust." In the letter, Nathan explained: "Influencing our judgment in this case, among other things, is our recognition that the intent of the temporary possession and short display of the magazine was to promote the First Amendment purpose of informing an ongoing public debate about firearms policy in the United States, especially while this subject was foremost in the minds of the public" after the Connecticut school massacre and President Obama's address to the nation. The Associated Press noted that Nathan said there were other legal ways to prove the point and that "there is no doubt of the gravity of the illegal conduct in this matter, especially in a city and a nation that have been plagued by carnage from gun violence." He said it was a "very close decision" to not bring charges. Gregory picked up and showed the magazine during his conversation with the National Rifle Association's Wayne LaPierre. Gregory asked LaPierre whether it's possible that mass shootings such as the one in Newtown, Conn., could be prevented if such high-capacity magazines were made illegal. LaPierre said such a ban would do no good because determined killers would find other ways to carry out such attacks.